ANT-VC is a modern 3-floor, 4-bedroom villa (with an additional convertible bedroom) in the heart of the exclusive Cap d’Antibes on the French Riviera. 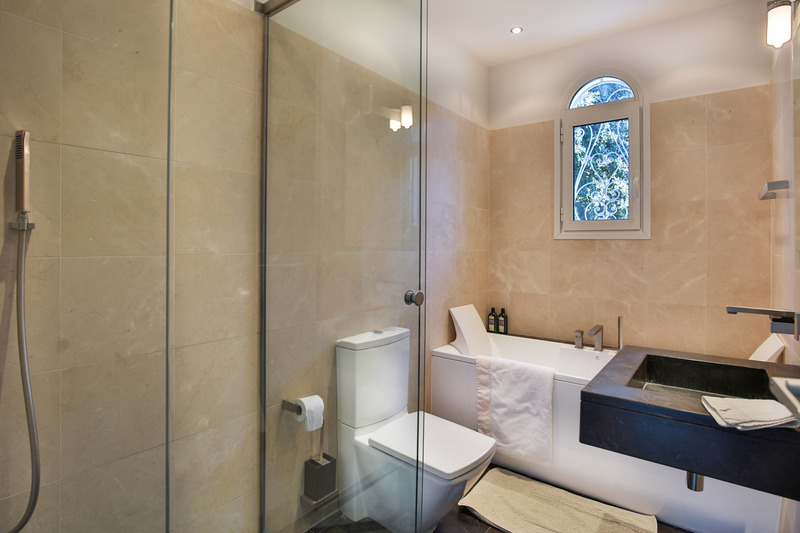 The 450 square metre villa is situated on grounds of 0.4 acres. 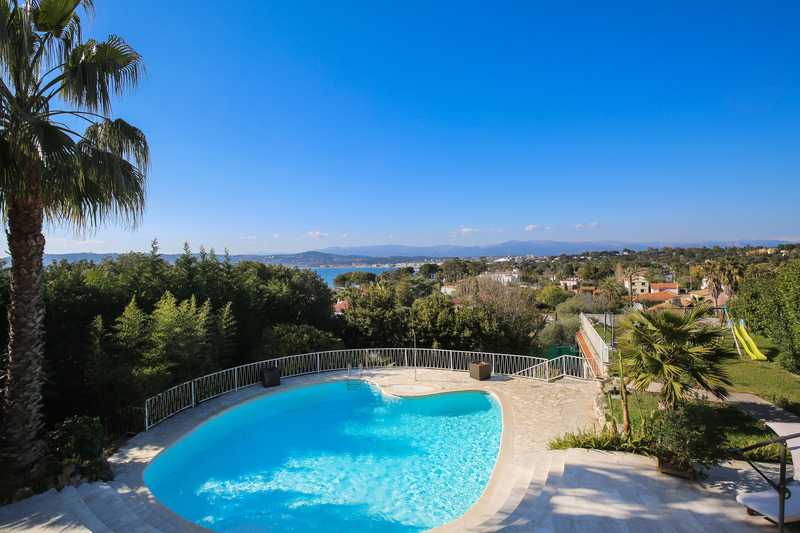 Villa Capucine is a modern 4-bedroom (with an additional convertible bedroom) villa in the heart of the exclusive Cap d’Antibes on the French Riviera. The villa is fitted out to the highest standards and decorated throughout in a contemporary style, except for the downstairs studio that has been maintained in a Provençal style. 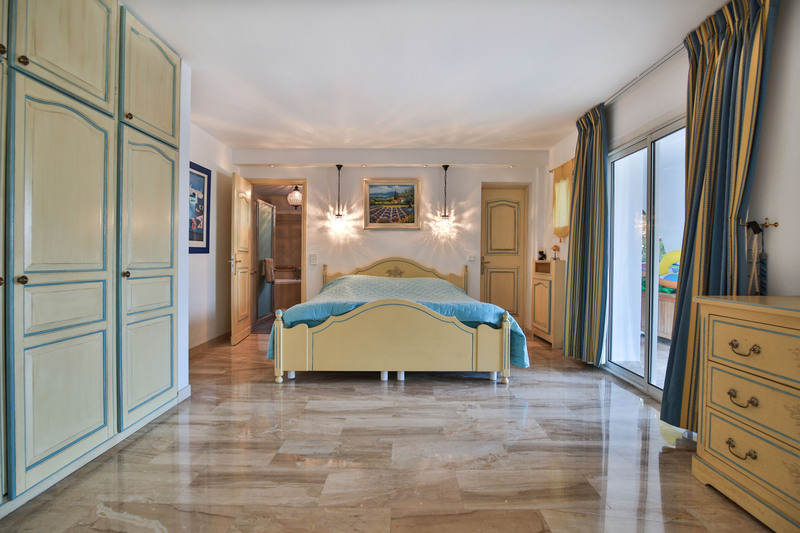 The villa has 4 permanent double bedrooms and 1 further bedroom with a sofa-bed. 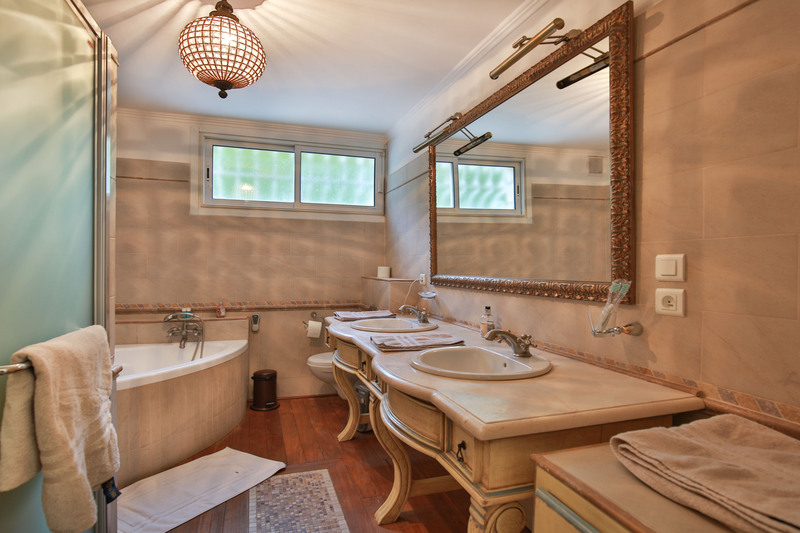 The villa sleeps 9 people comfortably. On the ground floor: main living room with television and surround sound speaker system; office/study (with safe); kitchen with breakfast counter; guest bathroom; and indoor/outdoor dining areas. On the first floor: master bedroom with en-suite bathroom (double shower and bath) and balcony with sea views; 2 permanent double bedrooms with sea views; 1 bedroom with a sofa-bed; 2 additional bathrooms (showers in both, bathtub in one). 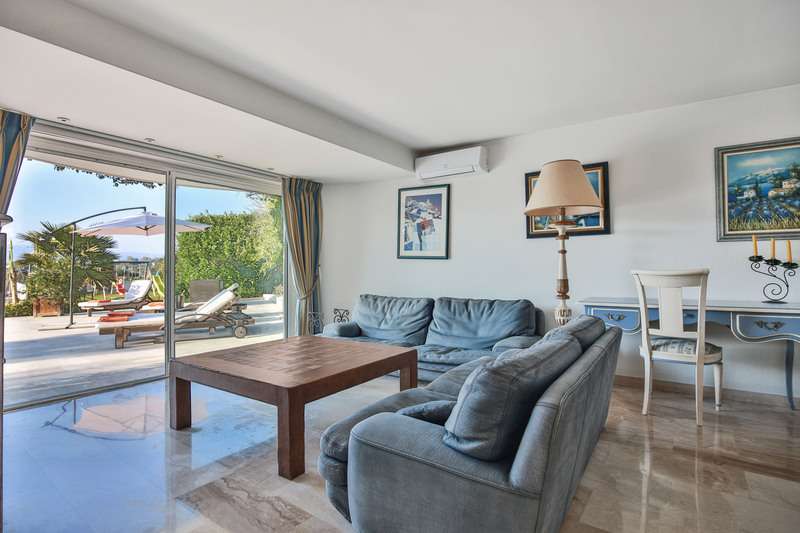 On the lower ground floor: studio bedroom with own living room (sofas and television), en-suite bathroom (shower and jacuzzi bath), and en-suite games room (4-player card and chess table); sauna and shower facilities. Pool access via the lower ground floor or ground floor terrace. 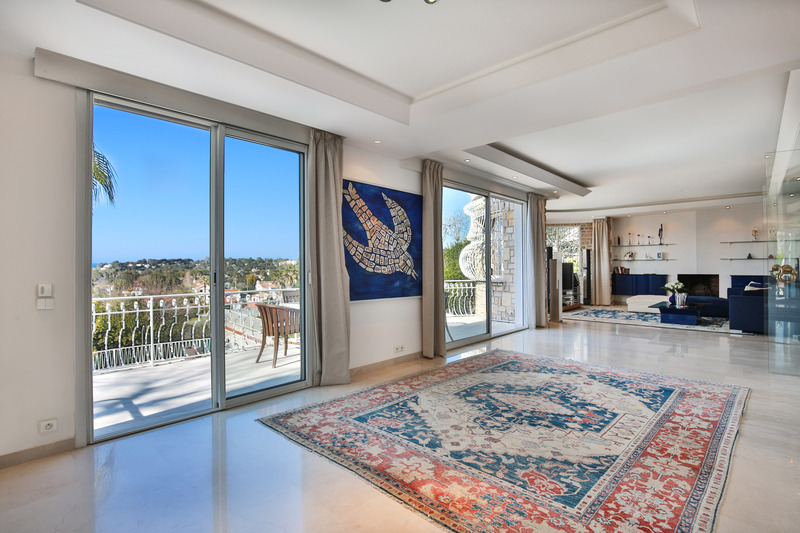 The terrace on the ground floor (with 8-person dining table) and the balcony on the first floor featuring stunning views of the Bay of Juan les Pins and the Île Sainte-Marguerite. Outside on the lower ground floor is a swimming pool (heating available upon request), sun loungers, and a 4-person table. The garden has a trampoline, swing and slide for children, and a built-in brick barbecue. In the front of the house there is space for 2-3 cars to park, with further parking possible on the street. Air conditioning in all bedrooms. Heating throughout. Multi-car parking in the front drive. Fully-equipped kitchen with 30+ bottle wine cooler, 4-hob stove, oven, microwave, coffee machine, and toaster. Dishwasher. Washing machine. Dryer. Sauna room. Television in main living room includes Apple TV and DVD player; downstairs television includes DVD player and HDMI connection. Main living room includes speaker system with wifi connectivity. Other Wifi speakers are available in the Master bedroom, Sauna room and downstairs studio bedroom. Wifi throughout the house. Desktop computer. Housekeeping included 3 times a week for a total of 9 hours (3 hours per visit). Laundry service available for additional fee.